It’s kind of funny: When I started this blog, I was determined to post every day. (Some days I even posted more than once!) As the years went on, I ran out of energy for that, and now I’m happy to blog only when I have something to say. But I’ve gotten so used to that being just once a week or so, that when there are more thoughts or stories or quotes bursting to get out, I feel weird. Like I have to wait. Like I need to space them apart. But I don’t believe in saving good stuff for later, and I now have over a dozen drafts waiting to be finished and posted. When it rains, it pours. 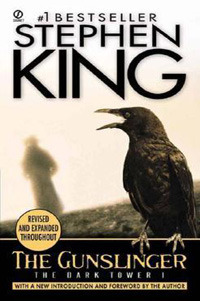 After years of talking about it, I finally started reading Stephen King’s epic fantasy series The Dark Tower. It’s one of Andy’s favorites. So far I’ve only finished the first book, THE GUNSLINGER, which was certainly an interesting and compelling read. Andy joked that he didn’t understand most of it because he was only 12 at the time that he read it. Well, I’m nearly 30 and I still didn’t understand it all. I felt endlessly powerful and endlessly optimistic; my pockets were empty, but my head was full of things I wanted to say and my heart was full of stories I wanted to tell. Sounds corny now; felt wonderful then. Felt very cool. More than anything else I wanted to get inside my readers’ defenses, wanted to rip them and ravish them and change them forever with nothing but story. And I felt I could do those things. I felt I had been made to do those things. I read The Gunslinger, but I never read the rest of the series. I enjoyed it, but it didn’t grab me enough for a long-term commitment. It did help me clarify something about one of my characters. I’d thought of her as a gunslinger, and I even wrote her that way early on, but then I realized that she’s a killer, which is very different. That was helpful. I just thought of a funny story about this. Some years ago. Tiyana Marie White, a really cool blogger (who seldom posts anymore ::sigh::) happened to mention a radio detective show called The Adventures of Philip Marlowe, which she’d discovered somewhere. The show was broadcast in the late 1940s and early 1950s, obviously long before she was born. Well, it was before I was born, too, but I am a devoted fan and I have 101 episodes (all that I’ve ever found) on my MP3 player. So, we had a nice exchange about the show, but what an odd thing to connect about. Random (but fun!) indeed. Btw, I love that her blog is named after a fictional news outlet that she made up for her own book, haha!